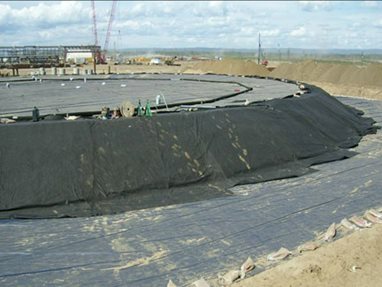 Layfield's High Temp geomembrane materials are designed to resist degradation underneath heated storage tanks. This ensures that in the event of a spill the liner will still be ready to protect the environment. Layfield supplies many materials for drilling and exploration of heavy oil including secondary containment liners, geotextiles, geogrids, and tarps and enclosures. Although similar to the drilling and exploration markets, heavy oil is unique in that most tanks and storage containments are heated to reduce viscosity. Permanent secondary containment installations of heated oil storage tanks require special lining materials to resist heat degradation. Layfield has developed a full range of liner materials for both long term and short term secondary containments of heated tanks.